Many water sports enthusiasts find their way to our campground for our location and convenience. We have a large waterfront launching area for kiting, windsurfing, kayaking, canoeing, jet skis, small boats or sail boats. 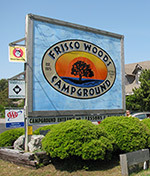 Located on the Pamlico Sound on the Cape Hatteras National Seashore, Frisco Woods is your waterfront destination. You'll find a more delightful combination of beautiful vacation rentals seashore wonders, and southern hospitality, all within the shadow of the Cape Hatteras Lighthouse than at Lighthouse View Oceanfront Lodging. Located on the oceanside village of Buxton, North Carolina, their beachfront campus offers some of the best views on Hatteras Island! The Orange Blossom Bakery & Café is truly an institution on Hatteras Island. Originally built as as the Orange Blossom Motel in the 1950s, the name comes from orange trees that were located on the property.